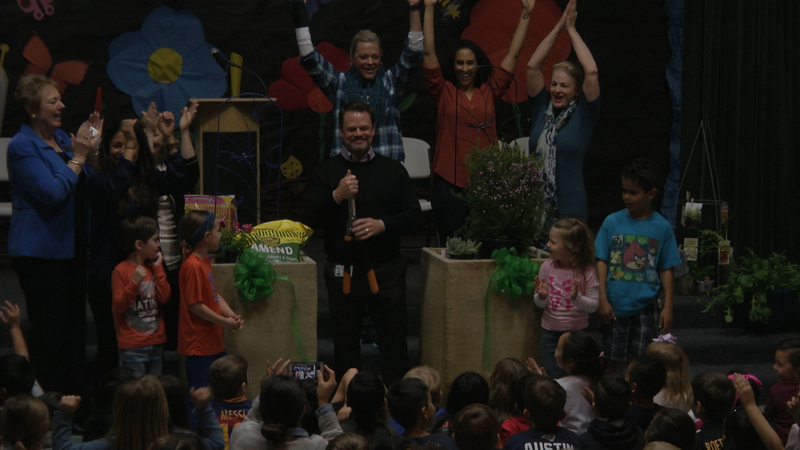 Charles Helmers Elementary School celebrated its new school garden and the implementation of a Garden Curriculum into their classes on Friday. The ceremony showcased various speakers involved in bringing the garden to life: Natalie Freed, a parent of a student at Helmers, who came up with the idea to bring a garden into the school; Lisa Ely, founder of Karden Garden School Garden Curriculum, who will lead the hands-on classes that will correlate with concepts the students are learning in their individual grade levels; Elizabeth Rydall, who was brought in to paint a mural that accompanies the Learning Garden; and finally Principal Pete Bland as well as other school officials spoke to celebrate the new program. Efforts began last year when Freed had the idea to start a community garden at the elementary school. A year, plus a $10,000 grant from organic seed company “Seeds for Change” and help from the “Lowes Heroes” volunteer work crew, the idea is alive and ready for students at Helmers to get to learning in the garden. Thank you SCVTV for being there to support this new school garden! We can’t wait to have you back out there for garden classes too! Natalie Freed you’re on TV!! !